The AEMC 1227 is a portable, easy-to-use instrument which uses an airflow sensor designed to accurately measure and log airflow or wind speed. The logger can be used to perform a variety of recording tasks with an easy and intuitive setup from a computer using supplied DataView® software. The ergonomically designed case designed for simple one-hand operation, large blue luminescent backlit display, and intuitive function selection make this instrument the right choice for any application. It offers both USB and Bluetooth Low Energy (BLE) communications interfaces for easy connection to a PC. 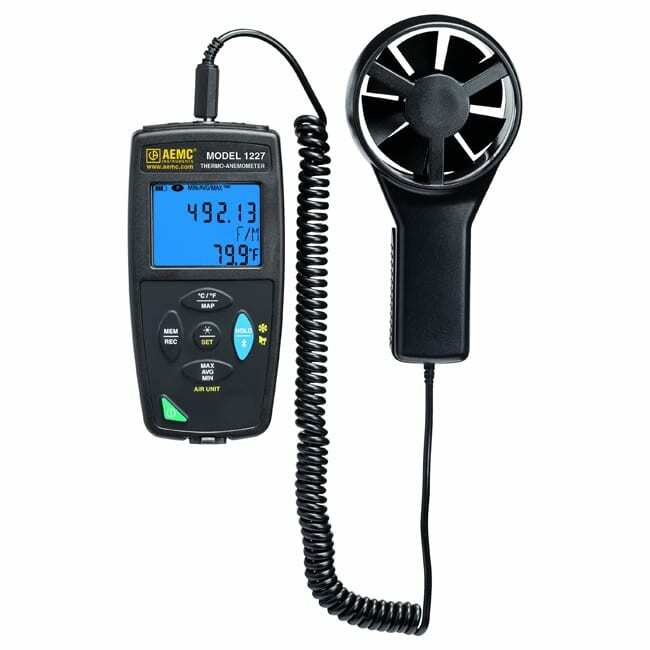 The AEMC 1227 Thermo-Anemometer also provides selectable measurement units to best fit your needs. DataView® graphing and Analysis software included. Memory 1,000,000 measurements on each channel (4MB). Recorded data is stored in non-volatile memory and will be retained even if battery is low or removed.